The theme this week is Christ is our Glory. In Exodus, we read the story about Moses displaying God’s glory in his face and needing to wear a veil. In Psalm 99 we are reminded the Holy Lord was seen in the pillar of cloud, and he is holy. In 2 Corinthians we read that the veil of Moses is symbolically removed when we are transformed into the glory of Christ. This week’s sermon is from Luke 9 and reminds us Jesus is the glory and the story behind our story. Suggestion: Have someone read Luke 9:28-36 prior to the sermon. Introduction: People love stories, especially stories that last. How many of you remember stories your parents told you? What about your grandparents? Do you have a favorite Bible story? What about a favorite Jesus story? Suggestion: You may want to ask the congregation to share a couple of their favorite Bible stories or Jesus stories. Share yours. I’m sure you realize the gospel was preached for years by verbally sharing the stories about Jesus. 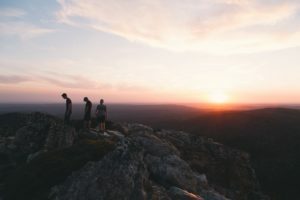 One of the stories rarely considered a favorite Jesus story is the Transfiguration story, which is found in all three synoptic Gospels – Matthew, Mark and Luke. What is fascinating though, is today’s story is not just about what happened on the mountain during the Transfiguration, but also what happened afterwards. There is a story behind the story on this Transfiguration Sunday. Now about eight days after these sayings he took with him Peter and John and James and went up on the mountain to pray (Luke 9:28 ESV). Luke says, “about 8 days”; Matthew and Mark both say, “And after six days.” All three authors are showing a period of time between when Jesus prophesied his death and this transfiguration event. There is no contradiction because many people count days differently. If I say something will happen after six days, how do you count those days? Is today the first day? Is the day of the event the sixth day? Or the seventh day? None of the authors are making a point about the days—they are just showing there was a time lapse. A couple things you can note: Jesus took his three closest disciples with him, and he took them to a mountain to pray. The mountain image is central to the story of Israel. They are going “up the mountain” like Moses used to do with God, like Abraham did with Isaac, like Elijah did when he was on the run. And as he was praying, the appearance of his face was altered, and his clothing became dazzling white (Luke 9:29 ESV). That’s an important image for the time. Laundry in Jesus’ day was a brutal, primitive process. Clothes were stomped on in a bucket, and then hung up to dry, sometimes brushed with a hedgehog hide to get the nap and the dirt out. Once a wool garment was washed, it was considered less valuable. In that society clothing was a mark of status. If you were wealthy or part of the upper class, your clothes were cleaner…and newer. It was very rare to see white clothe—there was no such thing as soap, the roads were mud, and many people rarely bathed. To be “radiant, intensely white, as no one on earth could bleach them” was a very rare observation. Today we might not even notice, but Peter, James and John certainly did. And behold, two men were talking with him, Moses and Elijah, who appeared in glory and spoke of his departure, which he was about to accomplish at Jerusalem (Luke 9:30-31 ESV). The fact this is Moses and Elijah brings out much speculation. But it is interesting when Moses came down the mountain with the Ten Commandments his face was radiant, shining from the glory of God. You can’t help but speculate that Peter, James and John got to view a bit of God’s glory when they saw this transfiguration. I love how Luke summarizes here that Moses and Elijah “appeared in glory and spoke over his departure.” The apostles weren’t invited into the conversation, but Jesus allows them to get a taste of what it looked like for him to go home for a moment. They got to see Jesus get energized to prepare for what’s next. Moses and Elijah represent the law and the prophets, almost like the left brain and the right brain, the logical and the artistic. Here are two major parts of humanity coming together. Here also is the whole story of Israel. Aside from God himself, Moses and Elijah were the most revered characters in Jewish history. And here they are standing with Jesus. Now Peter and those who were with him were heavy with sleep, but when they became fully awake they saw his glory and the two men who stood with him (Luke 9: 32 ESV). When they became fully awake… they saw. Jesus, after all the danger of the beginning of his ministry, is showing them that yes, God is behind all of this. The law and the prophets and the many centuries were leading to a destination—and here he is! Behind this story, behind our own small story, is the great story! The story of it all is grace, the grand story of it all is goodness, the grandest story of it all is Jesus! When they became fully awake… they saw! May we be fully awake today and see! There are those moments, occasionally, when it seems God lets us see through to the great story where we see that the law, the prophets and all the story of humanity is part of his grand narrative. The story behind the story. It’s like when my kids were born into the world and all the pain and fear and worry evaporated for just a moment. Or when we are here worshipping and there is a connection and an understanding in the body of Christ that we find nowhere else. Or when forgiveness is shown, when someone finds freedom from addiction, when the frenzied soul finds rest and a cup of cold water. These are moments when we see the true narrative, the true story. There’s something behind, beyond, and more important than these little stories we see on the surface. There’s something that somehow ties all these loose ends together, all these pieces that don’t seem to make sense. This is the ultimate demolition of what we used to believe about faith, about working our way to salvation, about the law over grace. It’s not about what we do and how good we are; this is Jesus’ story. His story involves all people and is beyond all of us. It is Jesus in his glory. And as the men were parting from him, Peter said to Jesus, “Master, it is good that we are here. Let us make three tents, one for you and one for Moses and one for Elijah”—not knowing what he said (Luke 9:33 ESV). Peter has been ridiculed through the centuries in various sermons, but let’s look at this again. Although he seems to have the spiritual gift of bending his foot up and shoving it in his mouth, this happens because he’s the only one with the grit to say something! While everyone is dumbfounded or trying to think of the perfect thing to say, at least he is saying something! This is why he becomes one of the greatest heroes of the church. Three tents. Peter is referring here to the feast of booths—a Jewish festival at harvest time every year. They would build small booths where they would hang out for the festival and feast. This was a time to thank God for all the proceeding year’s provision and to pray for a good rainy season. But it was also designed to help them remember their wilderness journey from Egypt to the promised land. Peter is thinking—this has got to be it! This is the Promised Land, let’s hold onto this moment! But God cuts him off. Peter doesn’t realize that the Transfiguration shows us who Jesus is, and in Jesus we understand the kingdom is already, but not yet. The kingdom is here and yet is to come. We get this blinding, dazzling moment, but that’s not where we live, not where we set up our tents right now. As [Peter] was saying these things, a cloud came and overshadowed them, and they were afraid as they entered the cloud. And a voice came out of the cloud, saying, “This is my Son, my Chosen One; listen to him!”(Luke 9:34-35 ESV). Just as they had a moment of clarity, the cloud rolls in. This is the cloud for their protection. This is the cloud of God’s presence that was on the holy of Holies, this is the cloud that led the children of Israel through the desert. This is the cloud that hovered over the waters at the first creation and now hovers here at the time of the new creation. God says the same thing he said at Jesus’ baptism: this is my Son, my chosen one. Let’s listen to that, as we are looking behind the veil to the bedrock story, the grand narrative, what is God’s final word on you: you are my child, my chosen one. All the things you’ve been called in your life, all the names and epithets you’ve been called don’t compare to this bedrock reality—you are God’s child and chosen one first; that’s where we start. “Listen to him!” It’s not about Moses or Elijah, God tells us, listen to Jesus. And when the voice had spoken, Jesus was found alone (Luke 9:36 ESV). Alone. That will be the theme for most of the gospel story. Jesus alone. This is Jesus getting the last pep talk from his dad, that last little touch of home. Then suddenly, alone. He knows what that’s like. The nurse can hold your hand while you give birth, but it is finally you and only you who knows the pain of childbirth. One day your spouse will die, your children will be supportive, but much of the time you will be on your own. Alone. Someday all of us will die and there will be a moment where, despite friends and family, it will be just you and your body shutting down. Jesus not only knows what suffering, weakness, poverty and hunger were like—he experienced solitude as well. His strength is renewed here; he has looked to the story behind the story, but the moment has come for him take his final journey. He knows what that’s like, and he is with us even when no one else is. And just when you think this story ends, all three authors continue with the same story. On the next day, when they had come down from the mountain, a great crowd met him. And behold, a man from the crowd cried out, “Teacher, I beg you to look at my son, for he is my only child. And behold, a spirit seizes him, and he suddenly cries out. It convulses him so that he foams at the mouth, and shatters him, and will hardly leave him. And I begged your disciples to cast it out, but they could not.” Jesus answered, “O faithless and twisted generation, how long am I to be with you and bear with you? Bring your son here.” While he was coming, the demon threw him to the ground and convulsed him. But Jesus rebuked the unclean spirit and healed the boy, and gave him back to his father. And all were astonished at the majesty of God (Luke 9:37-42 ESV). “When they had come down from the mountain.” They have gone to see into the heart and core of reality, into the story beyond the story where the ends come together. And the next thing they encounter is the kind of story that makes the least sense in our world—the suffering of a child. This story of a child having seizures and being harassed by evil seems to make no sense. Do you see the contrast here? They’ve just witnessed the great coherence at the center of everything and here they are in the most incoherent situation on earth. The Holy Spirit led Luke, and also Matthew and Mark, to put these stories next to each other. This up on the mountain story contrasted with this down-in-the-valley story; the heights of clear beauty and the depths and ruin of the swamp on the same page. There is nothing more heartbreaking than watching a child suffer. Experienced doctors, people who have watched hundreds of patients die, still throw up their hands and weep at the suffering and death of a child. Here is a person who has no choice, no way of avoiding what’s happening to them, and doesn’t understand it. From a bird’s eye view, the blinding clarity of the Transfiguration is set next to the blinding darkness of this suffering world. I believe this story reminds us who it is who sees us. The beloved Son of God, the one who is far greater than Moses and Elijah, sees the conflicting, confusing world we have to live in. He sees that we live within beauty and ugliness at the same time. He wants us to know that he knows. He also wants us to know that the Transfiguration is the peek into the eternal, into what matters the most and the only reality that will be left standing in the end. He wants us to hold onto that, to look for glimpses of it, and to remember the story behind the story. Let the Transfiguration story remind you of who it is who sees you. Jesus knows you. He rejoices with you, he grieves with you. He is there in your mountains, he is lifting you through your valleys. You live in the not yet, but know he has eternity already secure for you. Remember he is the story behind your story. What’s the most blinding light you’ve ever seen? An arc welder? An explosion? The flash on a camera? What was that experience like? The sermon discusses how Jesus went off by himself to recharge (praying, resting, solitude), and perhaps that the Transfiguration was a “recharge” of touching base with the Father before his final journey. Why do you think Jesus went off to recharge like this? Do we have these kinds of practices in the modern Christian world? Why or why not? Simon Peter wants to set up three tents in this story (v. 33), believing that this is where they need to set up their tabernacles, as he would in his Jewish observance. But he is cut off by the voice of God and doesn’t do so. There are times when we want to “set up camp” where we find God’s blessing breaking through, but he always seems to call us “back down the mountain” into struggle and daily life. Why do you think that is? What does God teach us in that kind of journey? There is a stark contrast in this story between the Transfiguration (vv. 28-36) and the suffering of a child (vv. 37-43). Why do you think the Holy Spirit put these stories next to each other? Why this contrast of blinding light and painful darkness? Read Exodus 34:29-35 and discuss what it must have been like seeing Moses’ face display God’s glory. Share when you’ve seen God’s glory. 2 Corinthians 3:12-4:2 tells us our veil is removed when we see Christ and are transformed into his glory. Share your story of when God removed your veil and helped you see him.